A second man has died following a crash involving three lorries in Lincolnshire. The incident happened on the A1 near Little Ponton on 2 July. 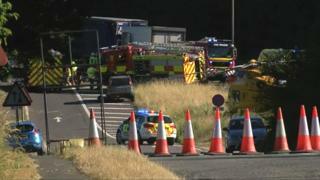 Lincolnshire Police said a passenger in a white DAF lorry has died in hospital. The driver of the vehicle died at the scene. Both men are in their 50s and come from London. The two drivers of the other HGVs involved were taken to hospital for treatment. The lorries were in a queue of traffic caused by an earlier crash on the A1, when a bus and a car collided near Colsterworth.